The Red Colombian Tetra is a relatively recent addition to the list of aquarium specimens available for sale. This tetra is a somewhat larger tetra than can be semi-aggressive with smaller tank mates and may fin nip fish with larger fins. They do really well in schools (shoal) of 6 or more and may be behave better if kept in schools. They come from Colombia, South America - hence the common name. It is difficult to determine the difference between male Colombian Tetras and females by visible signs, but the female should appear slightly thicker when swelling with eggs. They should accept common aquarium foods such as flake, frozen and freeze dried foods. They are not picky. It's always a good idea to quarantine your Colombian Tetras before introducing them to your main tank so that you can monitor them for disease and also provide them with optimal water conditions and no competition from other tank mates for fish food. Temperament / Behavior : Keep them in small school (shoal) of 6 or more. They can be an aggressive tetra, so avoid keeping them with fish that have larger fins to avoid fin nipping. They may also bully smaller tank mates. Breeding : They can be difficult to breed in the home aquarium. They are egg layers. Tank Mates : Similar semi-aggressive tetras and fish that can take fo themselves since this fish can be a bully. Diet / Foods : Not picky eaters, they should accept flake, frozen, freeze dried and live food. Tank Region : Mostly middle and bottom. Gender : Hard to tell the difference between male and female from any visible signs. Females may bulge with eggs when ready to spawn. Fantastic tetra, I have 20 of these in my tank. They are a beautiful shoaling fish and if fed a healthy diet their fins become brite red and the spine turns a blue/greeny colour. I have four of these Colombian Tetra in a 55 gallon tank, along with 6 black skirt tetras, 4 flame tetras, a dozen cardinal tetras, 6 large red swordtails, 2 plecos, 5 green corys, and 4 long fin zebra danios. The tank is well planted with living bunch plants (anacharis) and bushy artificial plants, with plenty of room for swimming above the plants. They have behaved themselves well, no nipping or harassing the other fish. Fed a variety of flake, frozen, and live (adult brine shrimp) foods. Three of them appear to be 'filled out' and I think they are females. I'm going to try to move them outside this spring in an artificial pond to see if they'll breed. I have 2 columbian tetras in a 20 gallon, well planted tank. I also have 6 other tiger barbs in the tank. One of the columbian tetras is biting and bullying all the other fish? Any ideas to stop this? The columbian tetra is one of the more aggressive of the tetra species, and keeping more of them in a small school might lessen the frequency of the behavior you're noticing. But your tank is densely stocked already, so it may be time to upgrade that tank and then you may want to try introducing a few more columbians. A tetra, like others that needs to be kept in schools of 6 or more. A 10 gallon tank but preferably larger is needed. Has to be one of the most popular of the tetras. This freshwater fish is a very pretty blue and red and appears iridescent. Take your time when acclimating this fish to your tank. 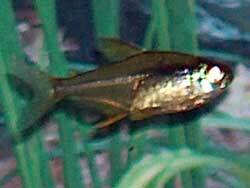 Has a lot of common names including the Blackline Tetra, the Penguinfish and the Hockey Stick Tetra.